DAMASCUS, SYRIA – After the U.S. launched “limited” airstrikes on Friday against Syria, U.S. Ambassador to the United Nations Nikki Haley announced that the U.S. will maintain its illegal presence in Syria until U.S. goals in the area are fulfilled, opening the door for the U.S. occupation to continue indefinitely. While the U.S. military presence in Syria has been ongoing since 2015 – justified as a means of countering Daesh (ISIS) — U.S. troops have since turned into an occupying force with their failure to pull out following Daesh’s defeat in northeastern Syria. Currently, the U.S. occupies nearly a third of Syrian territory — around 30 percent — including much of the area east of the Euphrates River, encompassing large swaths of the Deir Ezzor, Al-Hasakah and Raqqa regions. Though the U.S. currently has between 2,000 to 4,000 troops stationed in Syria, it announced the training of a 30,000-person-strong “border force” composed of U.S.-allied Kurds and Arabs in the area, which would be used to prevent northeastern Syria from coming under the control of Syria’s legitimate government. Though it backtracked somewhat after backlash from Turkey, the U.S. has continued to train “local forces” in the area. Russian military sources have asserted that former members of Daesh — who were allowed to leave cities attacked by the U.S. and their proxies, as was the case in battle for Raqqa — are to be included among the force’s ranks. This, along with the U.S. government’s insistence on maintaining the occupation until Syrian President Bashar al-Assad is removed from power, shows that the U.S. government has no intention of permitting the reunification of Syria and will continue to occupy the region over the long term. The illegal U.S. occupation of Syria has been widely noted in independent and corporate media, but little media attention has focused on identifying the wider implications of this occupation and the U.S.’ main objectives in keeping northeastern Syria from coming under the control of the legitimate, democratically elected Syrian government. As is often the case in U.S. occupations, both historical and present, it is an effort born out of two goals: resource acquisition for U.S. corporations and the destabilization of a government targeted for U.S.-backed regime change. Northeastern Syria is an important region owing to its rich natural resources, particularly fossil fuels in the form of natural gas and oil. Indeed, this area contains 95 percent of all Syrian oil and gas potential — including al-Omar, the country’s largest oil field. 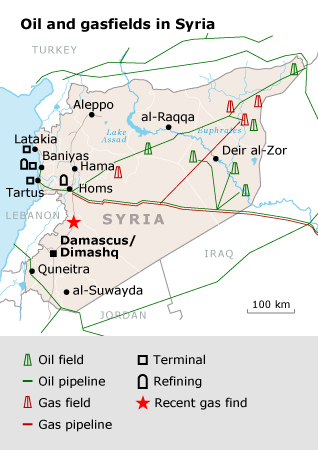 Prior to the war, these resources produced some 387,000 barrels of oil per day and 7.8 billion cubic meters of natural gas annually, and were of great economic importance to the Syrian government. However, more significantly, nearly all the existing Syrian oil reserves – estimated at around 2.5 billion barrels – are located in the area currently occupied by the U.S. government. In addition to Syria’s largest oil field, the U.S. and its proxies in northeast Syria also control the Conoco gas plant, the country’s largest. The plant, which can produce nearly 50 million cubic feet of gas per day, was originally built by U.S. oil and gas giant ConocoPhillips, which operated the plant until 2005, after which Bush-era sanctions made it difficult to operate in Syria. Other foreign oil companies, like Shell, also left Syria as a result of the sanctions. With the U.S. now occupying the area, the oil and gas produced in this region are already benefiting U.S. energy corporations to which Trump and his administration have numerous ties. According to Yeni Şafak, the U.S. along with the Saudis, Egypt, and Kurdish officials held meetings where decisions were made to extract, process and market the fossil fuels harvested in the region, with the Kurds being given a handsome share of the profits. As of 2015, the Kurds were said to be earning in excess of $10 million every month. Syria’s Kurdistan exports its oil to Iraq’s Kurdistan, with which it conveniently shares a border, and it is then refined and sold to Turkey. Though no corporations are publicly involved, the deal between Syrian and Iraqi Kurds was brokered by unnamed “oil experts” and “oil investors.” The Kurds in Syria and Iraq did not even sign the agreement in person. They were subsequently “informed” of the agreement by the United States and instructed to supervise the operation. A source in Iraq’s Kurdistan Regional Government (KRG) told NOW News that “with regard to southern Kurdistan, it was a company and not the KRG that signed the deal, and it is [the company] that directly hands over the sums in cash every month.” Given that over 80 foreign companies are involved in the KRG’s oil trade, most of them U.S.-based, we can safely assume that many of the same players have also been involved in developing the oil trade of Syria’s Kurdistan. The Trump administration’s numerous connections to the U.S. oil industry make this alliance clear. Former Secretary of State Rex Tillerson, who was fired in March, was previously the top executive at ExxonMobil, an oil company that unilaterally brokered an oil deal with Iraqi Kurds behind the back of the Iraqi government and has expressed interest in developing Syrian oil interests in the portion of the country currently occupied by the U.S.
ExxonMobil also had a major stake in the proposed Qatari pipeline, whose rejection by Assad was a likely factor in jumpstarting the Syrian conflict. Trump himself, prior to assuming the presidency, also had sizable investments in ExxonMobil — as well as in 11 other major oil and gas companies, including Total, ConocoPhillips, BHP and Chevron. In addition, even though Tillerson has now gone, his replacement, Mike Pompeo, is equally a friend to the U.S. oil and gas industry. Pompeo is the “#1 all time recipient” of money from Koch Industries, which has numerous interests in oil and gas exploration, drilling, pipelines, and fossil-fuel refining. While the U.S. occupation of Syria is no doubt motivated by a desire to exploit the region’s oil and gas resources for itself, the U.S.’ refusal to leave the area is also born out of a concern that, were the U.S. to leave, its chief rival, Russia, would claim the oil and gas riches of Syria’s northeast. Indeed, according to an energy cooperation framework signed in January, Russia will have exclusive rights to produce oil and gas in areas of Syria controlled by the Syrian government. Since 2014, the U.S. has been aggressively trying to limit Russia’s fossil-fuel sector, particularly its exports to Europe, and replace them with U.S.-produced fossil fuels. As former Speaker of the House John Boehner wrote in 2014, “The ability to turn the tables and put the Russian leader in check lies right beneath our feet, in the form of vast supplies of natural energy.” Allowing the Russian fossil fuel sector to strengthen, whether in Syria or elsewhere, would harm U.S. strategic objectives, U.S. corporate bottom lines and the U.S.’ vision of maintaining a unipolar world at all costs. For that very reason, much of the U.S.’ Middle East policy has been aimed at seizing control of territory and pushing for the partition of countries to secure safe transit routes for oil and gas. In Syria such plans to partition the country for this purpose date back to as early as the 1940s, when European oil interests in the country’s northeast began to grow. Since then, several countries have tried to occupy parts of northern Syria to secure control of the region for these strategic purposes, including Turkey and Iraq in addition to Western powers. A crucial pipeline already exists in northeastern Syria that connects Syria’s oil fields to the Ceyhan-Kirkuk pipeline. Though that pipeline sustained heavy damage in 2014, there are plans to rebuild it or build a new pipeline alongside it. Thus, northeastern Syria also boasts oil export infrastructure that could help Syrian oil travel easily to Turkey and thus to the European market. In addition, the conflict in Syria – now in its seventh year – was, in part, initiated as a result of clashes over two pipeline proposals that needed to secure passage through Syria. Syria, not long before the foreign-funded proxy war besieged the country, had turned down a U.S.-backed proposal that would take to Europe natural gas from Qatar in favor of a Russia-backed proposal that would take natural gas originating in Iran. Though those pipeline proposals are no longer as powerful in shaping motives as they once were – largely due to Qatar’s rift with other Gulf monarchies and improved relations with Iran – the northeastern part of Syria remains key to U.S. objectives. According to the German publication Deutsche Wirtschafts Nachrichten, the U.S. has developed plans to build a new pipeline from the Persian Gulf to Northern Iraq and into Turkey through northeastern Syria, with the ultimate goal of supplying oil to Europe. Russia, for its part, opposes this plan, as it seeks to maintain its own lucrative exports of fossil fuels to Europe. Beyond fossil fuels and pipelines, northeast Syria boasts several other key advantages in terms of resources. Chief among those is water – a resource of prime importance in the Middle East. The U.S.-controlled portion of Syria is home to the country’s three largest freshwater reservoirs, which are fed by the Euphrates river. One of those reservoirs now controlled by the U.S. and its proxies, Lake Assad, is the country’s largest freshwater reservoir and supplies government-held Aleppo with most of its drinking water. It also provides the city with much of its electrical power, which is generated by Tabqa Dam, also located in the occupied territory. Another key hydroelectric power plant is located at Tishrin Dam and is also controlled by U.S.-backed proxy forces. In addition to its abundant water resources, northeastern Syria is also home to nearly 60 percent of Syria’s cropland, a key resource in terms of Syria’s sustainability and food independence. Prior to the conflict, Syria invested heavily in bringing irrigation infrastructure into the area in order to allow agriculture there to continue despite a massive regional drought. Much of that irrigation infrastructure is fed by the occupied Tabqa Dam, which controls the irrigation water for 640,000 hectares (2,500 square miles) of farmland. Unlike the northeast’s fossil fuel resources, the U.S. is not hoping to gain financially from the region’s water and agricultural resources. Instead, the interest there is strategic and serves two main purposes. First, control over those resources – particularly water and the flow of the Euphrates – gives the U.S. a key advantage it could use to destabilize Syria. For example, the U.S. could easily cut off water and electricity to government-held parts of Syria by shutting down or diverting power and water from dams in order to place pressure on the Syrian government and Syrian civilians. Though such actions target civilians and constitute a war crime, the U.S. has used such tactics in Syria before, such as in the battle for Raqqa when it cut off water supplies to the city as its proxies took control of the city from Daesh (ISIS). Other countries, like Turkey, have also cut off the flow of the Euphrates on two occasions over the course of the Syrian conflict in order to gain a strategic advantage. By controlling much of the country’s water and agricultural land – not to mention its fossil fuel resources — the U.S. occupation will not only accomplish its goal of destabilizing Syria’s government by depriving it of revenue; it also invites a broader conflict from Syria and its allies, who are eager to prevent another long-term U.S. occupation in the Middle East and to reclaim the territory for Syria. Another way the U.S. has the ability to destabilize Syria through its occupation of the northeast is its plan to have the Saudis rebuild much of the area. Though the U.S. initially allied itself with the Kurds in northeastern Syria, opposition from Turkey has led Washington to focus more on working with Arabs in the area, particularly those allied with or formerly part of Saudi-allied Wahhabi groups, in order to create a Saudi-controlled enclave that could be used to destabilize government-controlled areas of Syria for years to come. The area is set to become much like the Idlib province, which is also essentially an enclave for Wahhabi terrorists. Despite Daesh’s defeat, their presence in Northeastern Syria, as the DIA reveals, was cultivated to provide a pretext for the foreign control of the region. Whether the Saudis or the Kurds ultimately end up dominating the portion of Syria currently occupied by the United States is besides the point. The main U.S. purpose in occupying the northeast portion of Syria is its long-standing goal of partitioning Syria, thereby permanently separating the country’s northeast from the rest of the country. Throughout the Syrian conflict, the U.S. government has repeatedly tried to sell partition to the public, arguing that partition is the “only” solution to Syria’s ongoing “sectarian” conflict. However, this sectarianism was cynically engineered and stoked by foreign powers precisely to bring about the current conflict in Syria and ultimately justify partition. WikiLeaks revealed that the CIA was involved in instigating anti-Assad and “sectarian” demonstrations as early as March 2011. Declassified CIA documents show that the plan to push partition by directly engineering sectarianism in order to weaken the Syrian state dates back to at least the 1980s. The partition idea was also repeatedly touted by the Obama administration, which stated on several occasions that it “may be too late” to keep Syria whole. Though the Obama administration has come and gone, the Trump administration is also set to push for partition, thanks to the recent appointment of John Bolton to the position of National Security Adviser. As MintPress recently reported, Bolton has long advocated for combining northeastern Syria with northwestern Iraq in order to create a new country, which Bolton called “Sunnistan,” that would dominate the two countries’ fossil fuel resources and would count on the key water and agricultural resources of the region to sustain the population. Bolton called for the Gulf Arab states, like Saudi Arabia, to finance the creation of that state – hence the Trump administration’s recent attempts to negotiate a “deal” with the Saudis by which they take over control of the U.S.-occupied portion in Syria if they agree to pay $4 billion for reconstruction. While gaining control of key resources for partitioning Syria and destabilizing the government in Damascus, the U.S.’ main goal in occupying the oil and water rich northeastern Syria is aimed not at Syria but at Iran. As U.S.-based intelligence firm Stratfor noted in 2002, taking control of Syria’s northeast would greatly complicate the land route between Syria and Iran as well as the land route between Iran and Lebanon. In January, Tillerson made this objective clear. Speaking at Stanford University, Tillerson noted that “diminishing” Iran’s influence in Syria was a key goal for the U.S. and a major reason for its occupation of the northeast. By cutting off the route between Tehran and Damascus, the U.S. would greatly destabilize and weaken the region’s “resistance axis” and the U.S. — along with its regional allies – would be able to greatly increase its regional influence and control. Given the alliance between Syria and Iran, as well as their mutual defense accord, the occupation is necessary in order to weaken both nations and a key precursor to Trump administration plans to isolate and wage war against Iran. With internal reports warning of the U.S.’ waning position as the “world’s only superpower,” the U.S. has no intention of leaving Syria, as it is becoming increasingly desperate to maintain its influence in the region and to maintain as well the influence of the corporations that benefit the most from U.S. empire. Acknowledgment: Investigative journalist Rick Sterling, who specializes in the Syria war, provided MintPress with some images and pertinent information that was used in this story.